That's Chloe and Baxter - Monty's friends. Well kind of. 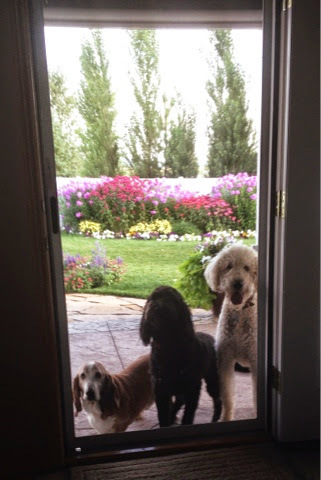 Monty wanted to wrestle Chloe, the black goldendoodle constantly while Baxter, the basset, tried to protect her. When the three of them were causing a ruckus, Toby (not pictured) hid under the chair or sat and observed. Smart dog. These pups live down the street from my in-laws and came to play a few times while we were living there. They had that beautiful yard to romp around in, play fetch, and sunbathe in.